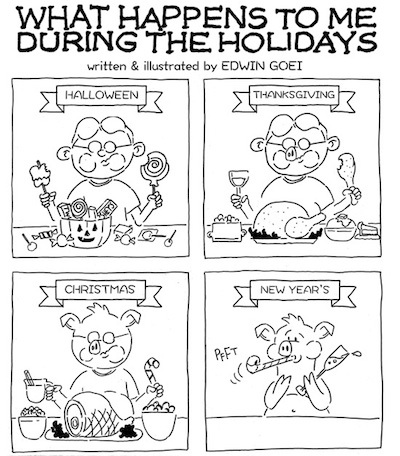 "What Happens To Me During The Holidays"
Here's a little cartoon I drew that was originally published in OC Weekly last holiday season. It seemed appropriate to re-run it today of all days. If you're wondering why the heck there are so many poke shops every where these days, you should read an article I wrote about the dude who started it all--Julian Fukue of PokiNometry. 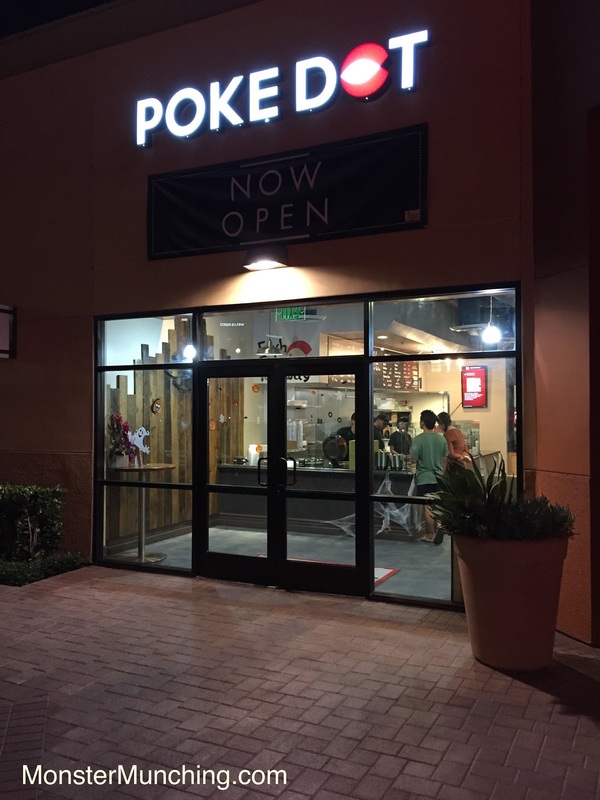 I point this out because it doesn't seem that most people are aware of how these build-your-own-poke shops became such a hot concept, not even a guest on Evan Kleiman's Good Food show on KCRW who was brought on to talk about the proliferation of poke. As far as that guest was concerned, the spate of poke shops just came down from the Heavens by way of Hawaii as though through Immaculate Conception. He had no idea that it was Fukue who figured out that poke lends itself well to the Chipotle assembly line concept, and most importantly, that there's a demand for it. After all, what is a poke bowl if not disassembled sushi that's cheap and filling. Since PokiNometry invented the concept, I've stayed relatively loyal to it and haven't tried too many of its knock-offs, but if you're going to copy PokiNometry, you can't do it better than Poke Dot. 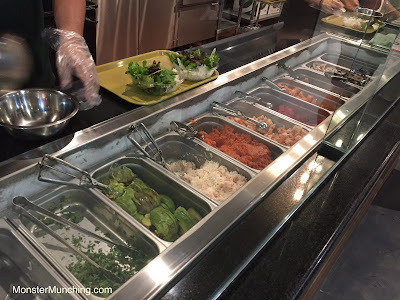 At Poke Dot, to build your meal, you start with the usual selection of small, medium, and large sizes that comes with two, three, or five scoops of fish (salmon, ahi, yellowtail, shrimp, octopus, scallop, and spicy tuna). For a base: rice, brown rice, salad mix, chips or a wrap. Then, cucumber, onion, avocado, and crab mix, which--like PokiNometry--are free. Also free: green onion, masago, seaweed flakes, ginger, wasabi, and sesame seeds. After that, it's off to saucing, which includes a house-blend in various levels of scorch. I write all of this down to show that like all the other copycats, Poke Dot is doing what PokiNometry does verbatim; but then, Poke Dot goes off and riffs on its own, adding jalapenos, tempura crumbs, and a cilantro dressing. But the extra options aren't what make Poke Dot great. 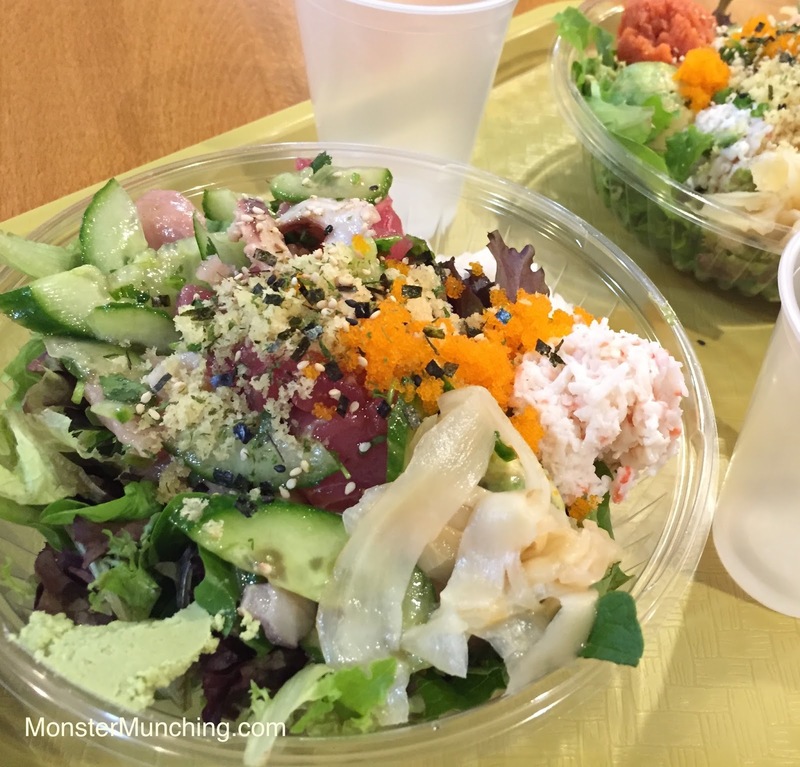 What makes it great is that Poke Dot's bowl satisfied me as much as anything I ate at PokiNometry--a meal that fulfills my sushi cravings without having to spend sushi dollars. And as I said, this is exactly why PokiNometry's idea is genius. Just remember who started it all: Julian Fukue, the Ray Croc of poke. IKEA's "almond cake with milk chocolate and butterscotch" didn't use to be that. It was once called the "Daim Torte." Daim, if you're not familiar, is a Swedish candy bar with almond butter and milk chocolate. And this cake--this same exact cake that IKEA is still serving right now--combines the flavor of that candy bar with cake in its thin layers of alternating strata. Whatever IKEA decides it wants to call it, it's one of the best things to get at the cafe, and I'm counting the Swedish pancakes, the meatballs and the 99-cent breakfasts. It's the exact right balance of chocolate and butterscotch, each component's gooey sweetness grounded by a cake that has oats in it. Even if there were such a thing as a Snickers cake, it could never be as good as this: the Daim Torte...er, "almond cake with milk chocolate and butterscotch." Well, I guess it easier to say than "TÅRTA CHOKLADKROKANT"
Someone recently asked me what food I was obsessing over at the moment. My answer was that it isn't a food, but a drink: Cancun Juice's aguas frescas. And it's true. In the past two months, I've patronized Cancun Juice almost bi-weekly. No, not once every two weeks--I go twice a week, rotating between the cantaloupe (superbly sweet and refreshing), the guanabana (soursop to us Southeast Asians), and the strawberry aguas frescas. It still boggles my mind that they're only $2 and they taste better than the smoothies Jamba Juice charge upwards of $5 for. But now I've actually formed a new Cancun Juice obsession: its tortas. And it's about time, because the tortas are what most of Cancun Juice's customers are ACTUALLY going there to consume. 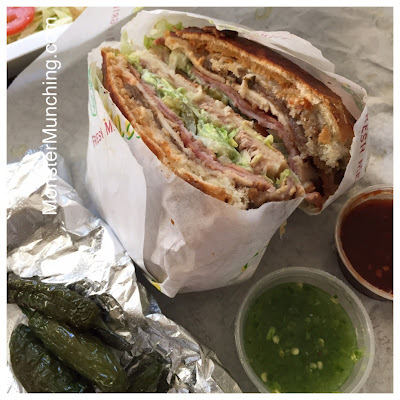 And my god are the tortas divine...and humongous. The English translation on the menu describes them as "Mexican subs", but they're more like aircraft carriers. On board are the usual enlisted crew of sandwich ingredients of tomato, lettuce, onion, and cheese. But the sandwich is also equipped with such advanced sandwich weaponry as refried beans, jalapeños, avocado cream, and chipotle mayo. The best torta I've had so far at Cancun Juice is the Cubana, which has all of the above and then loaded with not one, not two, not three, but four meats: pierna (pork leg meat), milanesa (breaded beef steak), jamon (ham), and pavo (turkey). When you eat it, it's a full-on assault on your hunger and senses--a blitzkrieg on a toasted bolillo roll that overwhelms your defenses until you surrender and admit this is one of the best sandwiches you've ever had. And the free deep-fried chiles they serve at the salsa bar? They're nuclear warheads. I've written about Zankou Chicken's rotisserie chicken before. There was a time I binged on it, eating there week after week, consuming bird after bird, smearing that toum (garlic paste) on every surface that was edible. When I went back recently (because the line at Halal Guys was too long and I was craving something that resembled a shawarma), I realized how much I've missed it. It's rotisserie chicken done to perfection. If you've not had Zankou and have thus far associated rotisserie chicken with Costco, you need to come and reset that definition. The chicken at Zankou's is the best chicken can be. It's cooked in literal stages, twirling on a multi-tiered oven, gradually moved up a level as time progresses. And because of this, each chicken is basted with the dripping juices of the other chickens that turn above it. Once it's reached the top, the skin is now fully rendered so that it's wafer-thin and flaky unlike anything you've ever peeled off a roasted bird. It's so wispy, so crispy, so intense from the fusing of the spices baked into it, my eyes rolled to the back my head when I tasted it. And then I dug into the hen full bore, tearing off fistfuls of juicy meat, laying down pieces of the skin, slathering that garlic paste like cake frosting as I assembled my wrap from a toasted round of pita bread. Oh, Zankou chicken. Is it any wonder Beck has sung your praises?